Carly is a good student with plans of going to Princeton, but when she gets the results of her SATs, she has a nasty surprise with a 1710. And then, just as she is receiving this news, she is contacted anonymously by the "Taker" who promises that he can fix her problem. And now she has to choose whether to accept the offer or not. This is a passingly good story but excruciatingly predictable, packed full of every YA cliche you can imagine. 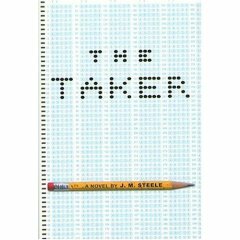 The authors ("J. M. Steele"), the blurb tells us, are a "pseudonym for two New York entertainment industry professionals" and the novel reads likea formula (picture a bunch of TV producers pitching a concept!). It's harmless (aside from its questionable ethics), it won't bore you, but it is mindless entertainment with a "surprise" ending that you will see coming by the time you're even half-way through the book.